PRM-Taiwan (Plastic Rubber Machinery-Taiwan) have been providing marketing and media services to the plastic and rubber machinery industries for over 10 years. PRM-Taiwan (Plastic Rubber Machinery-Taiwan) have been providing marketing and media services to the plastic and rubber machinery industries for over 10 years. The traditional method of finding plastic and rubber machinery suppliers was to visit fair shows to sign contracts and to discover new technologies on the market and while this is still an important tool for producing deals. It’s no longer essential. Our B2B online marketplace provide an easy and convenient plastic and rubber machinery search engine to meet your needs. 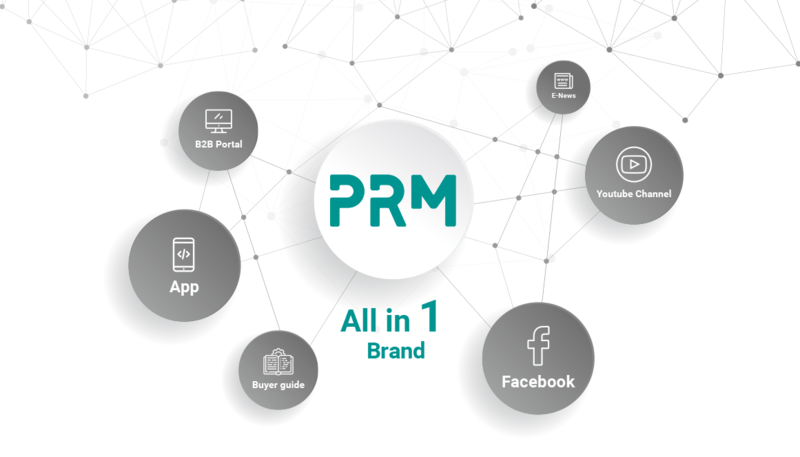 With PRM-Taiwan both new and established businesses can find the best machinery and news from the Taiwanese plastics and rubber industries all in one place. Being a marketing and media company, we also have inside interviews with fair show organizers, agents and companies around the globe. These companies are not just Taiwanese companies but plastic and rubber machinery market leaders who are on the ball with future industry trends. Our E-news often features these videos and articles and by becoming a subscriber, you can have these regular updates sent to your inbox. Apart from fair show knowledge, whenever there are new products and innovations made in Taiwan, we will also be the first to share this information with our followers. Find out more about how to have access to this exclusive information here. If however, you want more information on fair shows and to visit us in person that is possible too! We aim to attend 6-8 fair shows every year and go to all of the biggest events. Some places that we have been to recently or plan to visit soon include: K-Show Germany, Plastpol Poland, Chinaplas China, Plastindia India, NPE USA, Plasteurasia Turkey, Plastimagen Mexico, Interplas Thailand, Arabplast Dubai, Plastics And Rubber Indonesia, Taipeiplas Taiwan, Pro-plas South Africa and many many more. We have over 200 of the biggest and many of the smallest Taiwanese machinery manufacturers on our site and contacts with many more. Whether you are looking for full lines such as, recycling machines extruders, blow molding machines, injection molding machines and printing machines, or auxiliary equipment and parts such as gearboxes, barrels, screws, molds, dies, control systems and virtually anything related to the plastic and rubber industries including packaging. If it’s made in Taiwan, we will find it for you! We don’t just provide a listing of companies and products, but provide an interactive service, where our engineers can help you to communicate with the final supplier. We care about quality, so we visit all of the companies on our site every few months to see if there are any changes, and get updates on new products coming out of Taiwan. We also know a bit about the industry ourselves, so if you have a finished product that you would like to make, you can send us the picture, and we can advise you on machinery that can be used to help you to make the final product. Our personalized service doesn’t stop there. If you come to visit our booth at fair shows, our company can personally introduce you to Taiwanese companies that have the machinery that you are looking for. In our over 10 years of operation, we have helped over 100,000 buyers of plastic and rubber machinery find the solutions they need. You and your production line can be our next success story. Showing all the different types of plastic and rubber machinery within Taiwan, so that you don’t have to go to the factory in person, to see the inner workings of the machine. Chat with us in real time, so we can give you on the spot service to meet your needs, whether it be injection moulding machines, extruders or thermoforming machines, our experts can help you to find the machinery you need. Also we often update our news and share articles with our followers, so you are always up to date with the latest happenings in the plastics industry. Want to search for plastic and rubber machinery and peripheries on the go? Download our easy to use plastic and rubber machinery search engine App and let us bring Taiwanese companies to your mobile device! The answer is YES!!! If a Taiwanese company sells their plastic processing machinery to your country then we can help you. We have users monthly from Asia, Europe, Africa, North and South America and Oceania. We have inquiries and purchases from nearly everywhere including blow moulding machines to Germany, thermoforming machinery to Italy, extruders to China, bag making machines to India and printing machines to Turkey and all of these places already have their own large plastic and rubber machinery manufacturing industry. We also service countries that others might not be able to export into such as rubber injection molding machines to Syria, dispersion kneaders to Libya, blown film extruders to Iran and pipe making machines to Iraq. It doesn’t matter where you are in the world, Taiwan has what you are looking for. Taiwan as one of the 4 Asian Tigers underwent a rapid transformation in education, prosperity and stability that cultivated a perfect environment for the research and development of many industries. This included the plastics and rubber processing machinery market. Many of these companies before the 1990’s completed OEM contracts for big name companies in Europe and The USA. So what was developed and built in Taiwan was rebranded and sold for triple the price in Europe and The USA. This gave indigenous companies access to the latest technologies in fields such as injection molding, printing, extrusion and blow molding and now more and more companies within Taiwan don’t just have the knowledge, they have the confidence to project their own brand, the Taiwanese brand around the world. Other places around the world that have cheaper prices often have unpredictable quality issues. For example, you might be getting rock bottom prices, but if the raw materials that you buy are PE mixed in with PET and PP then when it comes to heat sealing your plastic bags, the final products won’t be useable, or if in your injection molding machine the clamping pressure is inconsistent or lower than advertised, the final plastic product won’t be to the standard required. Lower quality molds and dies also wear out quicker meaning a replacement will have to be purchased much earlier. All of these factors lead to increased prices at a later date for your plastic and rubber machinery. This all means that Taiwanese companies, with the latest technologies, best quality and traditionally lower plastic and rubber machinery prices that are sometimes up to 60% cheaper than the European competition are now gaining more and more market share in the plastic and rubber machinery industry. interactive service that means we can help you to easily make an informed decision on the plastic or rubber machine that meets your demands. If it’s made in Taiwan, we will find it for you!